The guy who makes what movie characters see on their computer screen shares some insight on how he creates the fake user interfaces. We've all been watching an action flick where a character has to do something on a computer and a few images flash on the screen conveying just the right information but not resembling how a real computer looks at all. Someone has to make the images that read "Intruder Alert" or "Access Denied," and that person is Mark Coleran. He has designed the computer sequences in movies like The Bourne Identity, Tomb Raider, Children of Men, and Mission Impossible III. The National Public Radio has a gallery of images from some of Coleran's more memorable designs. The challenge is to convey vital information in a very short span of time, and he said that quite a bit of inspiration for that comes from videogames. 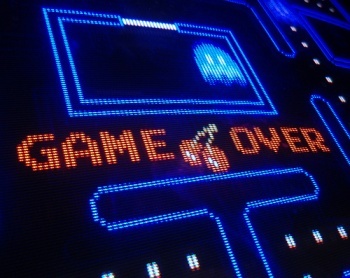 "The 'Game Over' thing, it's a very big word that splashes across the screen, and it tells you exactly what's happening," he said. Coleran admits that what you see on the screen is not truly interactive at all. The actor says his lines and there is a either an operator offscreen advancing the animation or it's a preprogrammed script. "They're not doing anything at all other than acting," Coleran said. He call it pseudointeraction. "It looks like they're interacting with the device," Coleran says, "but what's really happening is we are watching them do what they do, and we have ways of controlling it and firing it off and cueing it up so it looks like they're doing stuff in real time." "The entire point of those things is to tell a story," he said. "'I can't get into the computer.' How do you tell somebody in two seconds, onscreen, that they can't get into that thing?" It can sometimes be frustrating watching movies and seeing computers being manipulated in ways that us nerds know is completely unrealistic (Hackers anyone? ), but it is heartening that at least some thought goes into designing such interfaces. Coleran has said he's even seen his designs seep into real applications. "And unfairly, sometimes we get credit for it." Coleran is nothing but modest.